Evolution of 芭比娃娃 电影院. I think Barbie's appearance/character 设计 is getting severe. 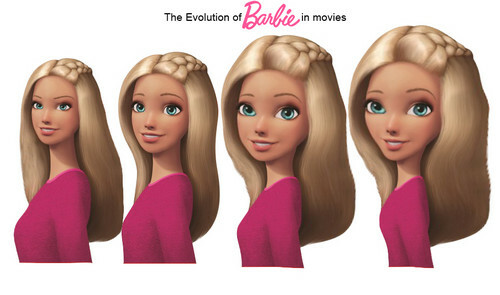 Barbie's features are become 更多 and 更多 cartoonish. Oh wait she's also transforming into an 日本动漫 (like in Video game hero). it's really painful to see the changes in the design.. HD Wallpaper and background images in the 芭比 电影 club tagged: photo barbie evolution movie barbiemovies. I think that's a bit extreme. While I don't disagree that Barbie's appearance has changed a lot, I think the whole shtick in Video Game Hero is just a one-time thing (and even then, Barbie only looks weird in the video game world, in the real world she still looks like normal Barbie). If you want a company that's become extreme about their characters' body proportions, try Disney. Well I agree her looks have been drastically changed which is one of the things I don't appreciate on the second note I agree with Lexie about one time thing in Video Game Hero. But I really really hope Mattel bring back her old look. The right one looks horrible, why they have to made her head to be bigger? She looks like an alien and definitely doesn't looks like Barbie now. I prefer her old look more. @mystery4life: I know but I won't be like it if they animated her like that in future movies.